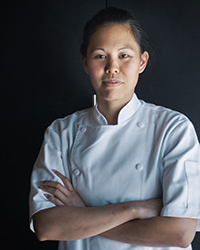 Why She's Amazing: Because after working with her co-chef Daniel Ryan in some of the world's most acclaimed kitchens, the duo is cooking up sublimely inventive food—like wild onion madeleines and savory pumpernickel macarons—at their very own spot. On Working Side by Side with Daniel Ryan: "There's no competition between us. We're a team and it's more or less that we feed off each other." Newly Discovered Ingredient: "I had never tasted a pawpaw before [coming to North Carolina]. To say I had never seen or tasted a product before from the US—that's pretty huge. It's custardy, with this velvety, mango flavor." She and Ryan use the fruit to make a pawpaw soda at One. On the North Carolina Food Scene: "I believe wholeheartedly this could be the next scene."